What Are the Different Types of Trumpet Mouthpieces? There are many different types of trumpet mouthpieces, including beginner's, intermediate, and advanced mouthpieces. Many different types of trumpet mouthpieces can be found. They are generally differentiated by rim width and sharpness, cup size, and depth and the size of the throat. The measurements of these specific parts of the trumpet mouthpiece determine whether the mouthpiece is likely to be suitable for the specific player. As such, mouthpieces for most brass instruments can be split into beginner’s mouthpieces, intermediate mouthpieces, and advanced mouthpieces. Generally, more advanced players will be able to handle more difficult mouthpieces which give them more control over the tone. The rim of the trumpet mouthpiece is the part that comes into contact with the players’ lips. Two aspects of the rim important to the selection of trumpet mouthpieces are width and the sharpness of the edge. A wider rim is more suitable for beginners, because it allows for increased comfort and therefore increased endurance when playing the instrument. A narrower rim gives the player more flexibility and ability to increase the range produced by the instrument, and generally has a brighter tone. Mouthpieces with narrow rims are generally better for experienced players. The cup of the mouthpiece is the main opening which the player blows into, inside the rim. Trumpet mouthpieces have either large or small cup diameters and deep or shallow cups. Larger diameter cups give the player more control over the tone produced by the instrument and make it louder. Smaller diameter cups are primarily suited to beginners, and allow for more endurance during play. Depth of the cup is another factor that differentiates trumpet mouthpieces, with shallower cups brightening the tone and deeper ones darkening the tone. Deep cups are more suitable for players using the low register a lot, and shallow cups are better for players frequently using the higher register. Medium cups provide a balance between high and low end tones, and most players will prefer a medium-depth cup for this reason. Players deciding between different trumpet mouthpieces also often look at the throat size to help them make their decision. The throat is directly underneath the cup, and the size of the opening can affect the tone and intonation of the instrument. Smaller types of throat allow the player more comfort and endurance during play, and add brilliance to the tone. Trumpet mouthpieces with small throats often flatten the higher register notes as well. Larger throats provide more blowing freedom and volume, but sharpen the high register. How Do I Choose the Best Beginner's Trumpet? 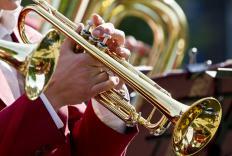 What Are the Different Types of Trumpet Warm-Ups? What Is a Piccolo Trumpet? What Is a Digital Trumpet? 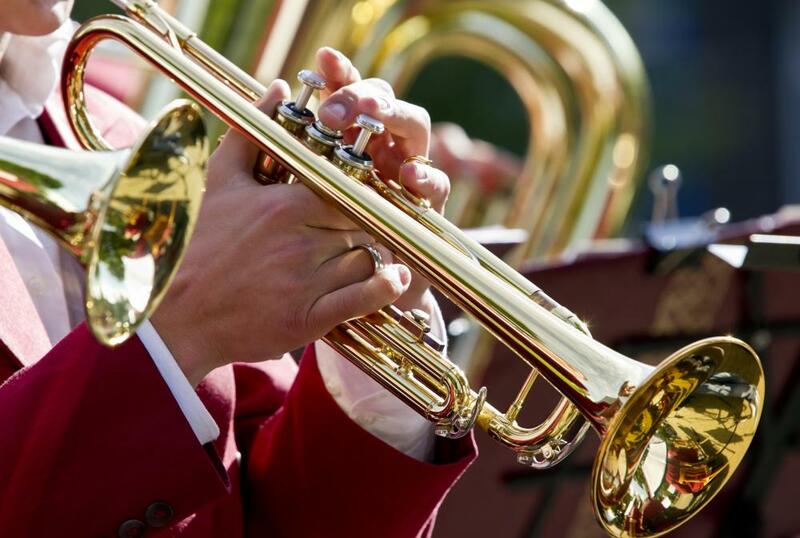 What Are the Different Types of Cornet Mouthpieces? Some advanced players switch mouthpieces like they switch their socks to change how they sound. But that never works. A different mouthpiece might help a player hit a note better, but it's not going to make them play differently. So technique is important. @ZipLine-- I actually think that you're in the right mindset when it comes to buying a new mouthpiece. It's great that you're getting recommendations and actually trying different mouthpieces before buying them. That is definitely the way to find the right one for you. My advice is to not get too stuck on a brand or number. The comfort of the mouthpiece and the quality of sound is more important. Don't rush yourself. Go back to the shop to try the same mouthpiece three times if you have to. If you find one that feels very comfortable and gives you good sound, go for it. Since you're an intermediate, make sure that the mouthpiece is not too narrow or wide. You still need more practice and control over your technique before switching to a narrow one. I've been playing trumpet on a beginner's mouthpiece for a while now. My teacher says that I'm now in the intermediate level. I've been wanting to buy a new mouthpiece but I find it all so confusing. I've taken recommendations from my teacher and my friends, but when I get to the store to try them, I don't like how they fit or how they sound. There seem to be so many different types of mouthpieces out there. The brands and the numbers on the mouthpieces make it even more confusing.